2018 saw major political tensions in separatist-controlled Donetsk, culminating in the assassination of local leader Alexander Zakharchenko on August 31. Power in the Donetsk “People’s Republic” (“DNR”) subsequently shifted to Denis Pushilin, the longtime Minsk negotiator, who has a reputation of being highly manageable and of having the Kremlin’s trust. The political strife before Zakharchenko’s assassination, the purge of his allies afterwards and the lack of public debate about who is guilty strongly suggest that the longtime separatist leader’s killing was either ordered or tolerated by Moscow. Under Pushilin, Russia undoubtedly increased its political, military and economic control over the “DNR”, bringing it to levels seen in the neighbouring Luhansk “People’s Republic” (“LNR”). The fact that Pushilin is a more flexible and civilian personality than the warlord-like Zakharchenko does not make a solution easier. The same can be said about the Luhansk “People’s Republic” (“LNR”) under the leadership of the intelligence officer Leonid Pasechnik. However, questions abound about both “People’s Republics’” internal stability. The fact that its leaders both consolidated power only after purging their predecessors’ supporters and that no credible competitors are expected to challenge them in the November 11 “elections” does not speak of high internal consolidation. Overall, the fundamentals governing the conflict remain unchanged. There are strong indications that Moscow’s goal is to maintain hotbeds of instability and deeply anti-western Trojan Horses in Ukraine’s flank. Under these circumstances, the best Ukraine can do is project good governance and prosperity into the areas it does not control and hope that the growing economic burden and/or ungovernability will make Russia rethink its support for the “People’s Republics”. 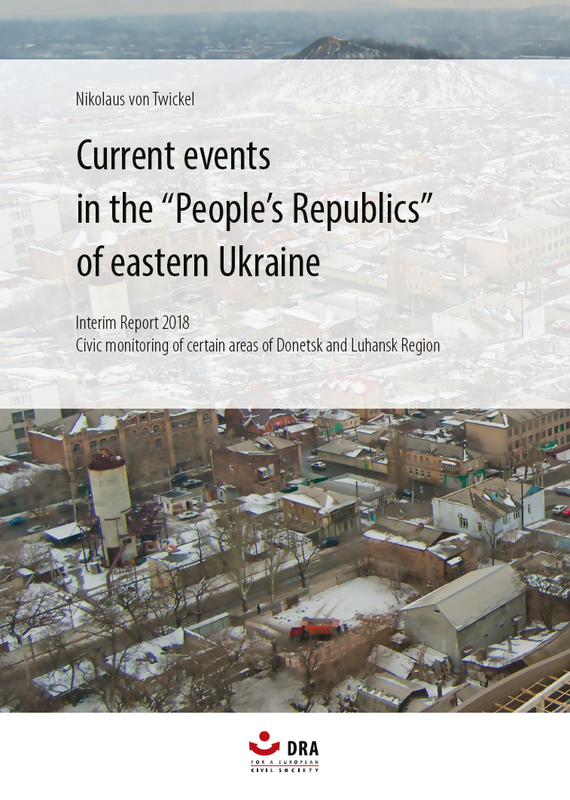 The report covers events in the Donetsk and Luhansk “people’s republics” over the period from January until October 2018. 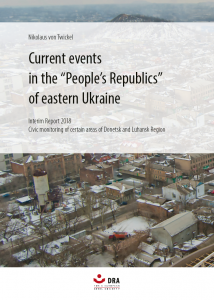 It is part of the project „Human Rights Monitoring in Eastern Ukraine“ of DRA e.V. Berlin and it is based on background interviews and the analysis of open internet sources. Photo credits: “Industrial city Donetsk” (2013) by Vladimir Yaitskiy, used under Creative Commons Attribution-Share Alike 2.0 Generic licence, desaturated from original.